On July 22, 2014, the Regional District of Nanaimo Board of Directors adopted the Lakes District and Schooner Cove Zoning Amendment Bylaws No. 500.384, 500.385 and 500.388 and Phased Development Agreement Authorization Bylaw No. 1692 (PDA Bylaw). 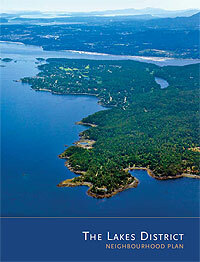 The adopted bylaws establish the zoning and community water and sewer standards for the long-term phased development of a range of residential housing types and densities, regional and community parks and trails, local commercial shops and services, and a mixed-use village and marina with a publicly accessible waterfront boardwalk and pathways, in accordance with the Lakes District and Schooner Cove Neighbourhood Plans in Nanoose. A public hearing for these bylaws was held on May 12, 2014 and the 20-year Phased Development Agreement term was approved by the Inspector of Municipalities on June 25, 2014. Adoption of these bylaws represents the final step in ensuring the land use regulations are in place for the developer to proceed with implementing the vision of the neighbourhood plans. Click here to view the full RDN staff report concerning the adoption of these bylaws. In tandem with the amendment bylaws, the Regional Board adopted the PDA Bylaw and endorsed the execution of a proposed Memorandum of Understanding (MoU), to guide the long-term development of lands within Lakes District and Schooner Cove. The PDA and MoU were executed on July 23, 2014. The PDA is a legally binding agreement between the Regional District of Nanaimo and the owner of the lands within Lakes District and Schooner Cove. The terms of this agreement dictate the phasing of development and related infrastructure over the next twenty years and the timing and provision of community amenities such as regional park land as envisioned in the neighbourhood plans. The Memorandum of Understanding is a non-binding agreement between the land owner and the Regional District of Nanaimo, which outlines practical considerations for future development and the anticipated courses of action needed to implement these developments. 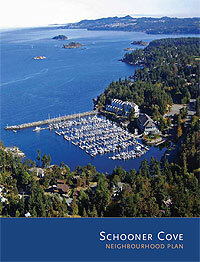 The Lakes District and Schooner Cove zoning amendment applications were submitted by Fairwinds to the Regional District of Nanaimo in July 2012. The purpose of the amendments was to establish the land use and subdivision servicing regulations to implement the vision of the Lakes District and Schooner Cove Neighborhood Plans which were adopted by the RDN Board in October 2011. The application process involved an in-depth technical and regulatory review, as well as substantial dialogue with the public and stakeholders to ensure that the proposed regulations reflected the neighbourhood plan policies. The following background information highlights previous staff reports and supporting application information as presented to the RDN Board and the public throughout the zoning amendment application process. On June 26, 2013, the applicant hosted a Public Open House at the Fairwinds Golf Course Clubhouse in Nanoose. Information was presented by the applicant at this meeting about the rezoning proposals for Lakes District and Schooner Cove.